Old world chameleons (Family: Chamaeleonidae) are a collection of visually distinctive taxa exemplified by a number of general morphological characteristics. Many of these characters are highly adaptive specializations unique to chameleons and a few other taxonomic groups. Chameleons possess zygodactyl feet. This is to say that the toe arrangement of their feet is such that two groupings of toes are formed in an opposing fashion. This adaptation is likely resulting from their arboreal nature as a mechanism for increased control and stability on tree branches. The zygodactyl feet of chameleons can be seen on this adult male Calumma ambreense. A second attribute of chameleons is their laterally compressed body. This feature is common to many arboreal lizards and the chameleon is no exception. 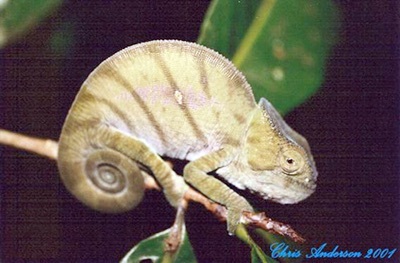 This characteristic is used by chameleons to, among other things, hide behind branches to avoid detection by predators. This stressed Furcifer lateralis shows the characteristic lateral compression of the body that is so typical of chameleons. A character that most notice of chameleons is their prehensile tail. Their tail is designed to serve as a fifth grasping tool to aid in their arboreal life. At rest, their tail can be curled under their body into the typical spiraled tail that is so often associated with chameleons. These male Ambanja Furcifer pardalis are using her prehensile tails to hold onto the branch behind them during their territorial battle. This juvenile Calumma parsonii cristifer has its tail rolled up in a typical spiral fashion. The independently moving eyes of chameleons are a particularly fascinating part of chameleon morphology. The eyelids of the chameleon cover all but a small opening over the pupil. Each eye turret can focus in any direction in its lateral hemisphere of the chameleon's head (right or left depending on the eye in question). Since each can move independently, the chameleon is able to see all around it without turning its head. This male Ambilobe Furcifer pardalis is using its independently moving eye turrets to look in two directions. One of the better known traits of chameleons is their ability to project their tongue out to capture prey. The mechanics of this ability are very complex and have been well described by Ken Kalisch in his Chameleons! 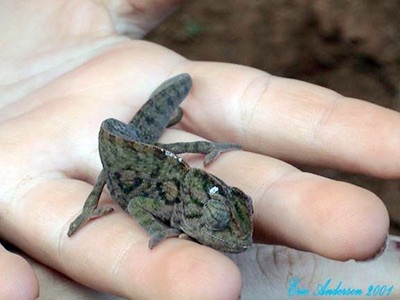 Online E-Zine article, The Oddities of the Chameleon: The Tongue. Chameleons also have the ability to change color. Many believe this is to match a background in order to blend in and hide using camouflage. 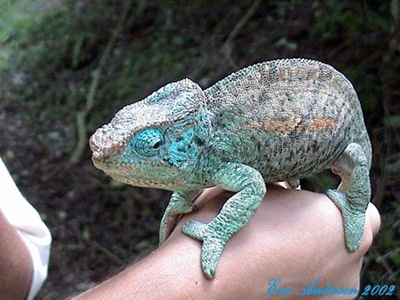 The truth, however, is that chameleons do not change color to match their background. 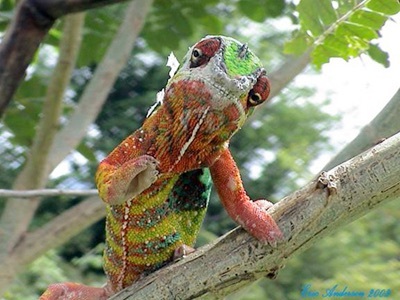 Chameleon color change is controlled by the central nervous system and hormonal cues. These cues trigger changes in melanin arrangement and distribution and alter the overlapping effects of pigments in chromatophore units in the skin. The chromatophores present in the skin of chameleons are a type of dermal chromatophore unit comprised of a melanophore containing black pigment, an iridophore (guanophore) responsible for blue colors, and a xanthophore (erythrophore) containing the red and yellow pigment. The melanophore is the deepest of the three cells with a dentritic process that wraps around the iridophore and xanthophore. The iridophore is located between the xanthophore on the surface of the chromatophore unit and the melanophore toward the rear of the unit. The orientation and arrangement of the contents of each of these cells in the chromatophore unit change the expression of different colorations due to the transmission of light over the overlapping cells and proximity of melanin to the surface. Such color change can be due to the external temperature, health, mood and reproductive condition of the animal or in territorial and display situations. 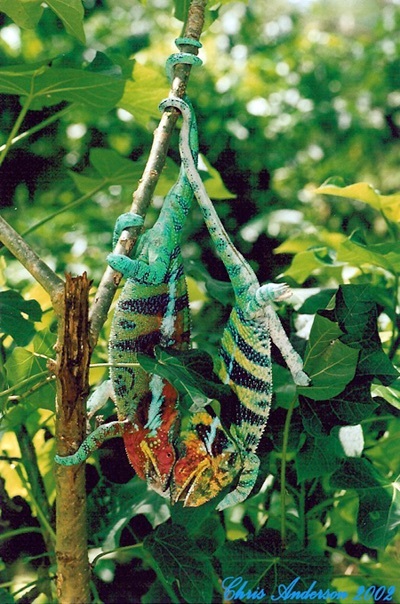 A more complete explanation can be found in the following article: Color Changing Mechanism in Chameleons.